Have you ever been to Siena in winter? It is beautiful, cold and local. City folk stroll along the cobblestone lanes in the evening, their long woollen coats float by as gentle snow drifts in from the dark cloudless night. 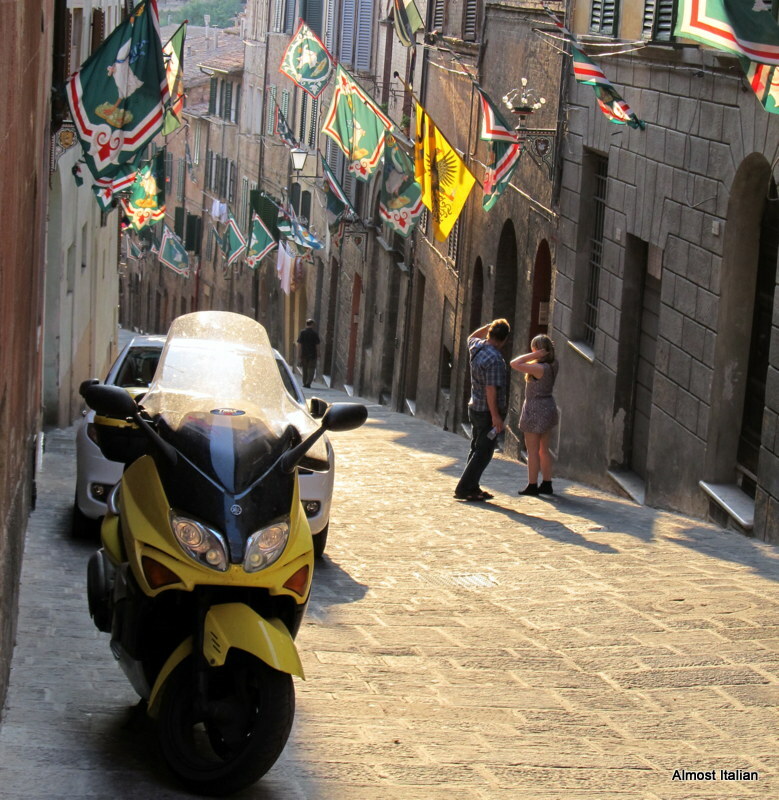 Loud whispers and laughter echo along the vicoli, the narrow lanes of the historic centre. It’s never too cold for the passeggiata. Although Siena is well touristed in any season, it is a nightmare to visit during July and August, as well as Easter. Out of season, it is a place of wonder, as tiny dark lanes give way to more and the Centro Storico twists and turns around its own steep hill. Getting lost daily is part of the joy. Visit in the ‘off- season‘ and stay for a long time to understand the real spirit of Siena. Beautiful city, in any season. 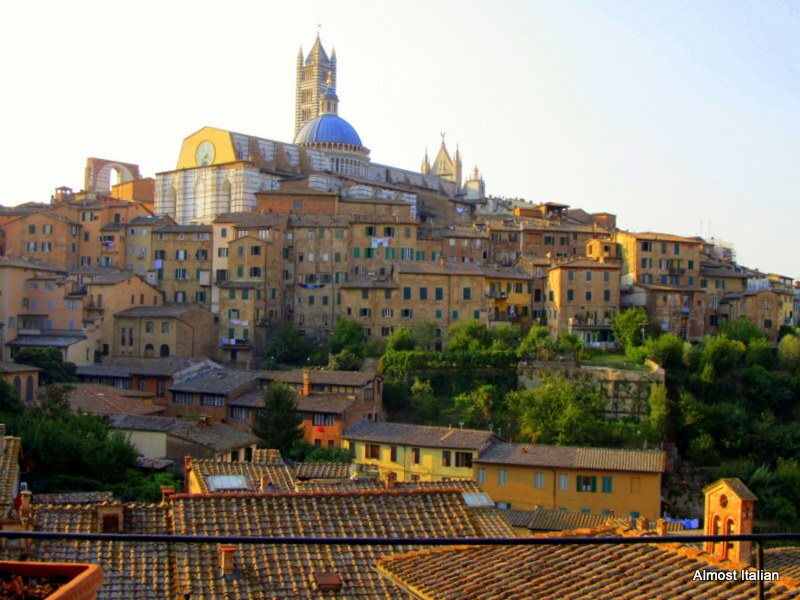 I studied there for a while and so fell in love with Siena. Thanks Liz, I’ll check out the link. would love to go for that market, Sounds like my idea of ‘Paradiso’! Mine too! Plus most stallholders will give you a taster before you buy!!! I heartily recommend it!! PS Great photos and a great post which brought back some fabulous memories! Thanks! I have been to Siena in winter and it is great. Several years ago, before there was a fee to get into the duomo, I went in very early one morning and I was the only person in there. It was magical. il duomo has become like a museum now! it makes me so cross when this happens to cathedrals. A place where we we could share a chilled bottle of Vernaccia after a long day of walking Julie. Go in winter, only a short hop for you. Love this take on Off-Season! Thanks for stopping by and liking my Off-Season Romance. I have to admit, I was stumped for quite a while on this challenge…..and since my blog is mainly about poetry with photos to complement, I was double stumped! But then the idea popped and voila…with some editing, it was done. So glad you liked it. Always especially pleased to receive a Like from a photographer. Although I must say, your words here about Sienna off-season could easily comprise a prose poem! We were in Bermuda for all of February, their winter, their off-season. We went with the idea of just “living” and experiencing being a part of it — rather than being a typical tourist. As you say here, “Out of season, it is a place of wonder, as tiny dark lanes give way to more “….no cruise ships, relatively no tourists, residents relaxed and unhurried, unjostled. So many lanes to discover, local eateries, local culture. If you go back to my blog, take a peek at the Travel Muse Header and look at the poem about Clouds with photos of St. Peters. We found serenity there — something you don’t often find during tourist season! So here’s to more off-season experiences! Yes, so many off season experiences in mine too. We tend to use the expression ‘out of season’ in Australia. My photos are only visual props for my words. I am a writer first and foremost, then a cook, and finally a traveller who takes photos. I only ever travel out of season. Ah, no wonder I loved your words so much! Winter in Italy can be so magical! I’ve been there only once (in 1977) and still think about it fondly. I plan to return! We are going to Florence and Umbria in October and hopefully will be able to wander around Siena for a night on the way back home. Siena is my bright spot! I’ve loved to meander the winding medieval streets and dine in the many cozy eateries with chefs who conjure up heavenly Sienese delights. Thank you for taking me back. It’s so good to share our memories of Italy, which you do so well too.